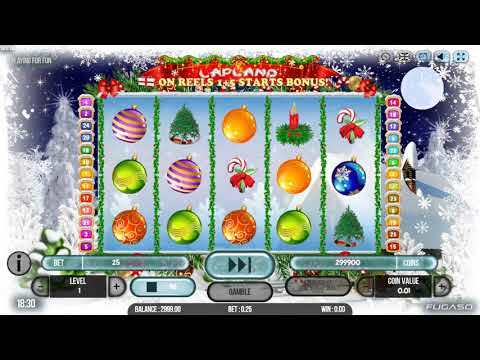 It feels like Christmas every day when you play the Lapland slot by Fugaso and listen to the festive music. Pick and Win up to 74 free games with doubled winnings when a Christmas Present lands on the 1st and 5th reels. Themed symbols of colourful baubles, traditional Christmas decorations and a Reindeer spin on the reels against the background of a cottage and a snowy night sky. You can risk all or half of winnings from successful spins in a choose a higher value card gamble game. Wrap up warm and enjoy a cup of eggnog as you play. The coin value in this 5 reel, 25 payline slot ranges from 0.01 to 1 and the total bet from 25 to 250. The control panel at the bottom of the gamescreen has buttons where you can adjust these values using the + and - buttons. Here you can also see the amount of the total bet and your balance in both coins and money. You can play the demo version of this slot, which works the same way as the real money game. Additional buttons allow you to open the paytable and rules of the game, set the maximum value of the bet and you can also see the local time. To spin the reels once use the button with 3 circular arrows on it or to set up to 100 automatic spins click on the button with 2 circular arrows and a play arrow. In the top right hand corner of the screen are buttons that allow you to change the language, turn game sounds off, see the game history and activate full screen mode.